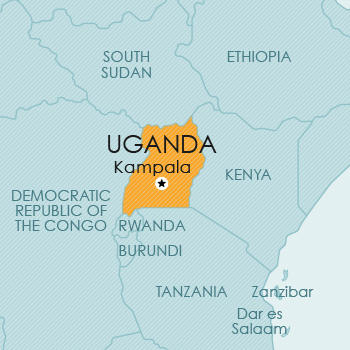 Uganda, an independent republic within the British Commonwealth, is situated in East Africa. It is a landlocked country bordered by South Sudan in the north, Democratic Republic of Congo in the west, Rwanda, Tanzania and Lake Victoria in the south, and Kenya in the east. Imports: Petroleum; cereals; medical supplies; capital equipment; vehicles. Uganda is a member of the Paris Convention, the ARIPO (Banjul Protocol), and the WTO/TRIPS. Although Uganda is a member of the Paris Convention, the Act does not make provision for claiming priority. It is therefore not clear whether convention priority can be claimed. Furthermore, although Uganda is a member of the Banjul Protocol of ARIPO, no provision is made in Uganda’s national law for the recognition of ARIPO registrations in which Uganda is designated, nor for the filing of ARIPO applications in Uganda. Provision is made in the Act for the registration of trade marks for goods and for services. However, as the Rules under the old Act are still in force, they make no provision for the classification or registration of services. The Act also provides for certification marks as well as for defensive registration of trade marks, and for the registration of series of trade marks. The Act further provides for the register to be divided into two Parts, Part A for trade marks which are distinctive, and Part B for trade marks which are capable of distinguishing. Uganda is a member of the Paris Convention, ARIPO (Harare Protocol), the PCT and the WTO/TRIPS. Patent protection is available via a national filing or via an ARIPO application designating Uganda. Uganda has implemented the Harare Protocol (which regulates patent filings in ARIPO) in its national law, thereby giving valid patent protection to applicants seeking to obtain a patent via an ARIPO application. Uganda has also implemented in its national law, by way of the Patents (Amendment) Act, 2002 the necessary provisions to recognise international applications under the PCT and designating Uganda, and to deal with national phase PCT applications in Uganda. Therefore, Uganda can be designated in PCT international applications, and PCT national phase applications can be filed and processed in Uganda. Uganda is a member of the Paris Convention, ARIPO (Harare Protocol), and the WTO/TRIPS. A United Kingdom design extends automatically to Uganda. Design protection is also available via an ARIPO application designating Uganda. However, Uganda has not implemented the Harare Protocol as far as industrial designs are concerned. Accordingly, it is not clear whether the rights derived from a design registered through ARIPO will be enforceable in Uganda. Uganda is not a member of the Berne Convention. derivative works such as translations, adaptations, arrangements, and other transformation of pre-existing works; and collections of pre-existing works, like encyclopaedias and anthologies. decrees, orders and decisions by courts or administrative bodies. Currently, no legislative provision for plant breeders’ rights or other sui generis protection for plants is available in Uganda.